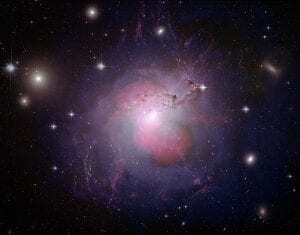 Radio jets, such as those pictured from galaxy NGC1275, impact star formation in radio galaxies. Image Source: Wikimedia Commons, Authors: NASA, ESA, NRAO and L. Frattare (STScI). On September 29th, Lauranne Lanz led a seminar titled “Panchromatic View of Jet Feedback in Radio Galaxies” at Wilder Hall. Lanz received her Ph.D in astronomy from Harvard University in 2013. She is currently a postdoctoral scholar at Dartmouth College studying active nuclei at the center of galaxies. According to Lanz, when dust falls into a black hole, the disks of dust that form help launch jets of particles which we can observe at radio frequencies. These powerful jets can transverse an entire galaxy and interact with the dust and gas between stars known as the interstellar medium. The radio jet feedback, affects the interstellar medium’s ability to form new stars, and the details of this phenomenon is an active area of research. Lanz studies how the jets impact star formation activity in radio galaxies and how they interact with the interstellar medium. When the jets come into contact with the interstellar medium, they inject mechanical energy into the dust and create a hot pocket of gas in the shape of a cocoon around the jet. This cocoon emits X-rays, and the turbulent motion of the gas drives shocks into cooler gas which then releases H2. Approximately 30% of radio galaxies possess large amounts of H2 at 100-1500 K which were heated by shocks and have liquid hydrogen. These traits are consistent with galaxies that get power from the mechanical energy dissipating from the radio jet. While not directly correlated with jet feedback indicators, star formation in these galaxies is suppressed by a factor of 3 to 6, which is a statistically significant difference from other galaxies. This suppression is likely to have the strongest impact on the stellar mass of moderately gas-rich galaxies. Lanz will continue to research how the radio jets impact the galaxies around them, and how stellar formation is affected by this phenomenon. Lanz, L. (2016, September 29). Panchromatic View of Jet Feedback in Radio Galaxies. Lecture, Hanover.